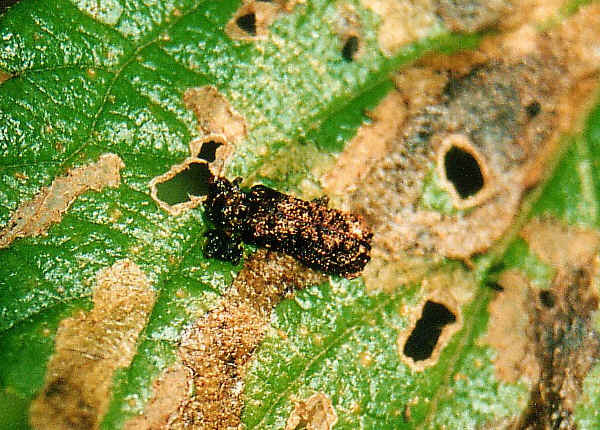 This page contains information and pictures about Lantana Leafminer Beetles that we found in the Brisbane area, Queensland, Australia. At first we saw there are some dirt on the leaf. Then we started to wonder why there were so many dirt with the same shape on different leaves. When we came closer, we noticed they were insects. Since they have hard wings cover with two wings meet at middle, we believe they were beetles. Then we received email from Dr. Kaae. 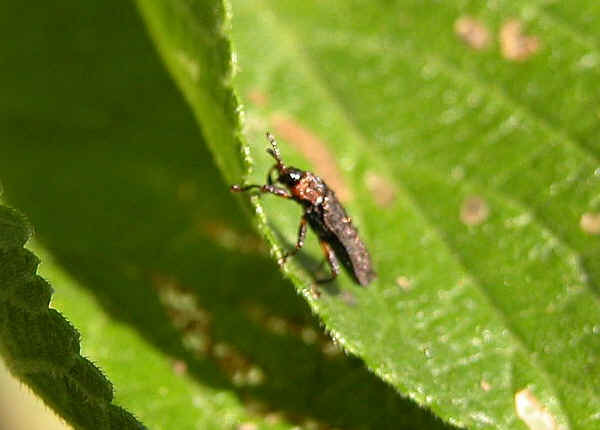 Dr. Kaae advised that the beetles are leaf beetles in family chrysomelidae. From this information we found out that they are Lantana Leafminer Beetles (also known as Lantana Leaf Beetles). Here we like to thank Dr. Kaae again. Lantana Leafminer Beetles are easily found on Lantana. 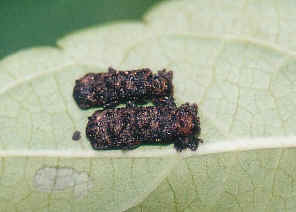 Their larvae mine in the middle layers of leaves and pupate there. 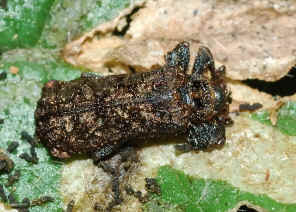 The adult beetles feed on the leaf surface. We noticed that the adults state motionless during the day. 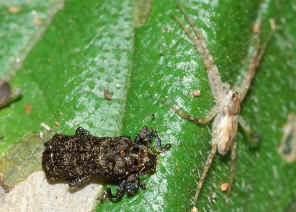 In late afternoon they become active. 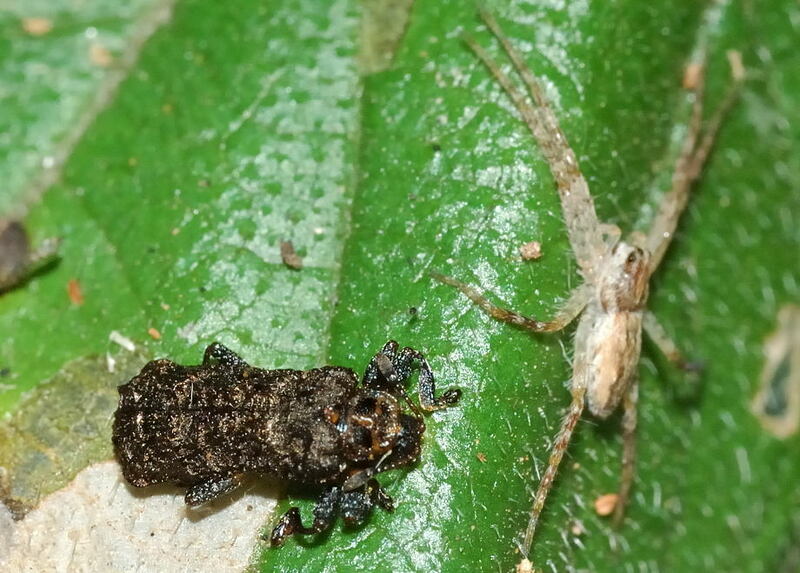 Some adults actively fly between leaves. 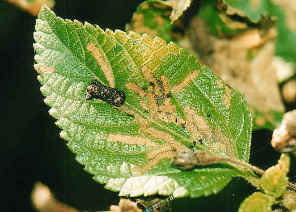 Lantana Leafminer Beetles are introduced to Australia as a biological control to the weed Lantana Lantana camara. 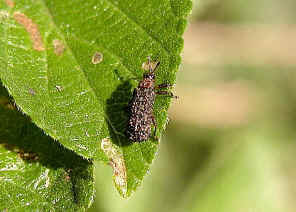 The beetle's feeding activities reduce plant vigour and suppress flowering. 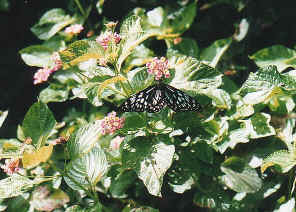 Lantana is also a common nectar source of butterflies and other insects. However, Lantana is a problem weed in Brisbane bushland. Lantana forms dense thickets that smother and kill native vegetation. The thickets are impenetrable for animals, people and even vehicles. Lantana is a woody shrub, its helps create bushfires. The Queensland Government introduce Lantana Leafminer Beetles as one of the biological control methods. There is another biological control to this weed, the Lantana Treehoppers. Thank to Chris Reid for the identification of this leaf beetle. See us in our Home page. Download large pictures in our Wallpaper web page. Give us comments in our Guest Book, or send email to us. A great way to support us is to buy the DVD from us. Last updated: March 09, 2009.